The SIMAC TANNING-TECH trade show boasts the largest selection of machinery and products for the footwear and leather goods industry. This year the event will take place from February 25th to 27th at the Milano Rho exhibition center at the same time as the LineaPelle Fair. With the slogan “EVALUTION” APIFIVE, API is taking the opportunity to revitalize its APIFIVE line of compounds which were first produced in the early 1990s. APIFIVE is a family of products expandable and cross-linkable with elastomers and rubber. Always appreciated for their excellent physical and mechanical properties, lightness and matt effect, these compounds have been further improved in terms of durability, comfort and appearance, in order to satisfy the new and growing technical and aesthetic demands of the footwear market. This EVALUTION has allowed APIFIVE to successfully find a natural new place in the fashion market, leaving room for the creation of innovative new designs and styles. API will present the new APIFIVE family of products at its Stand G48 in the Hall 14. 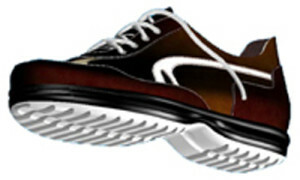 During the trade show, in collaboration with Wearlight (a company with a long history in the production of soles for shoes) and with the involvement of CMCI (a leading manufacturer of sewing machines), a special shoe will be made using an innovative system of stitching directly on a sole made from new-generation APIFIVE. With “Evaluation” APIFIVE, API further confirms its position of leadership in the high fashion footwear sector.